LONDON, UK and PORTLAND, Ore. — 20 September 2017 — The Body Shop announced today alongside digital growth company Urban Airship that it will launch a mobile wallet pass with the latest news and signature counts for its Forever Against Animal Testing campaign. Launched in June alongside Cruelty Free International, the Forever Against Animal Testing campaign aims to end cosmetic animal testing worldwide, through a petition that will be taken to the UN. The campaign will use mobile wallet passes to deepen ongoing engagement with supporters and help grow the 2,800,000+ signatures already collected online and in-store. Upon signing the petition online, people will be directed to a landing page where they will have the option to add the Forever Against Animal Testing wallet pass to their device. The wallet pass will also be linked in a thank you email, promoted by The Body Shop on social media channels and will provide regular news updates direct to users. Those receiving the pass from friends sharing it will have a link where they can go to sign the petition. Supporters can also use the campaign hashtag #ForeverAgainstAnimalTesting on social media to raise awareness of the issue. 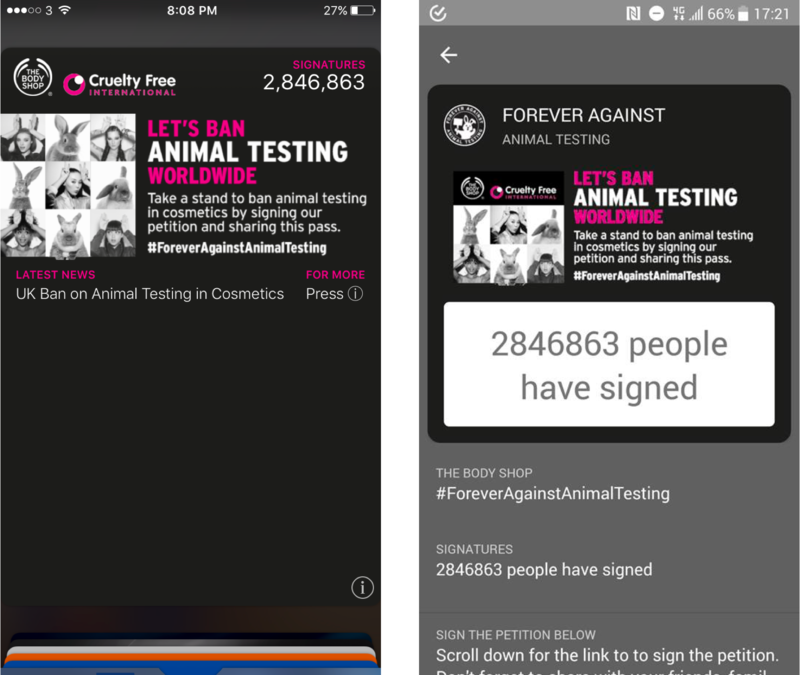 The Forever Against Animal Testing wallet pass for iOS (left) and Android (right) will deepen ongoing engagement with supporters and help grow the number of petition signatures collected. A recent Urban Airship study of one million Apple Wallet coupons and loyalty cards of major retail brands found that more than three-quarters of passes installed were the result of sharing rather than being distributed through a brand’s channels. Apple Wallet coupons had the highest rate of sharing, each one being added to 4.3 other devices on average, which The Body Shop’s cause-related campaign is expected to eclipse. Urban Airship® (www.urbanairship.com) is trusted by thousands of businesses to drive growth with mobile. Every day, marketers and developers depend on Urban Airship to deliver billions of digital moments through personalized, interactive notifications that inspire interest and drive action. Urban Airship is used by many of the world’s most admired companies, including Adidas, Alaska Airlines, The Home Depot, NBC Universal, Sky Media and Zillow. The Body Shop was the first international beauty brand to campaign against the practice of animal testing in cosmetics in 1989, leading the way to a European Union-wide ban on animal testing in 2013. Their Forever Against Animal Testing campaign, in partnership with Cruelty Free International, was launched in June 2017 and achieved 2 million signatures in its first two months. Cruelty Free International is the leading organisation working to create a world where nobody wants or believes we need to experiment on animals. One of the world's longest standing and most respected animal protection organisations, it is widely regarded as an authority on animal testing issues and called upon by governments, media, corporations and official bodies for advice and expert opinion. Educating, challenging and inspiring others across the globe to respect and protect animals, Cruelty Free International investigates and exposes the reality of life for animals in laboratories, challenges decision-makers to make a positive difference for animals, and champions better science and cruelty free living.